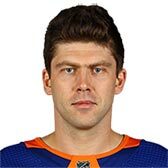 Semyon Varlamov is 6' 2 and weighs 209 pounds. He is currently 31.0 years old. Is not on the ice for practice.